Microsoft has intensified its efforts to increase take-up of its Windows Azure cloud platform. Last week it announced that the Azure Active Directory service was ready to use in production and launched the full version of its Azure based backup service. 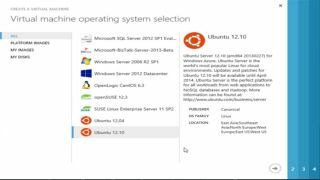 Today its Linux and Windows Server virtual machines (VMs) are moving from test to general availability, as part of the Windows Azure Infrastructure as a Service update. The move is part of the move to support companies developing a hybrid cloud - applications that connect to data and services across a number of data centres. "We want you to think about extending your data centre into our data centre, into Windows Azure" David Aiken, Windows Azure Technical Product Manager, tells TRPro. "We're not saying a business should move everything into the cloud; we want to use the cloud in ways that make sense to the business." He says the advantage is in getting things faster than with hardware in the office. "Many businesses still have the problem of this IT backlog," he says. "How we could potentially clear this backlog using Windows Azure is based on the speed at which we're able to deploy services. What could I get done if I could rattle through deployments at speed?" Possible scenarios include placing development and test labs on Azure, using it for SharePoint and SQL Server farms and to provide scalable, on-demand infrastructure for apps. Aiken also highlights virtual networking and connecting to on-premise and cloud infrastructure using a single identity with Azure Active Directory. Azure users now get access to a gallery of pre-built virtual machines running Windows Server, alone or with SQL Server, BizTalk or SharePoint already installed. The list also includes Linux VMs for OpenLogic CentOS 6.3, OpenSUSE 12.3, SUSE Linx Enterprise Server 11 SP2, Ubuntu 12.04 and Ubuntu 12.10. There is also a library of templates for content management including WordPress, Joomla and Drupal, plus e-commerce systems, wikis and other common server roles. If you prefer, you can upload your own VMs (for Microsoft's virtual hard disk format; newer VHDx machines which will be converted to VHD) which provides the option of changing your mind if Azure doesn't suit you. "You can take your SharePoint farm from Azure and spin it up on a Hyper-V box on premise. There's no lock-in," Aiken claims. Running servers in Azure is like running any other server, and new PowerShell cmdlets, available as part of the latest update, let you run scripts that can provision a VM, wait for it to boot and turn on remote PowerShell for further configuration. "In a single script you can connect, add a server, configure it, run an installer; as long as you can script it in PowerShell, you can run through everything you need to do in a single script," Aiken says. You can script non-Windows virtual machine setup as well. "We provide a Node.js set of scripts that will run on just about any desktop or server OS. You can download the scripts on an Ubuntu client or a Mac and run them against Azure." If you use a gallery image of Windows Server, the licence cost is already included in your usage based Azure billing, but that doesn't cover the other Microsoft products. "If you use SQL Server, we will bill you," Aiken explains. That does not apply if you upload your own virtual machine and you can use the licence mobility in enterprise agreements to apply your existing Microsoft licences to running the same products on Azure rather than on your own servers. But if you prefer to pay for usage, Aiken says using the gallery images lets you turn the usual up-front licensing costs into operational expenses; one of the typical benefits of using cloud services.